Super easy. Super convenient. Super cute. That’s how I would describe these little guys. I passed the mix and icing at the grocery store a couple of times, brainstorming what to do just as a little something extra. Well, when I signed up to make mini cupcakes at my daughter’s daycare for their Halloween party, it was the perfect opportunity! 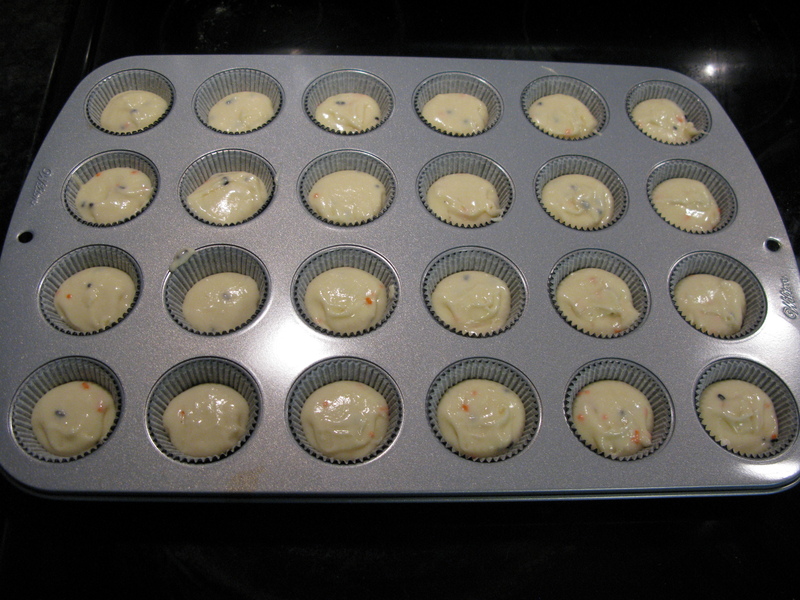 It’s white cake mix with the funfetti thrown into the batter to add some color. Same with the pre-colored orange icing with the extra funfetti. 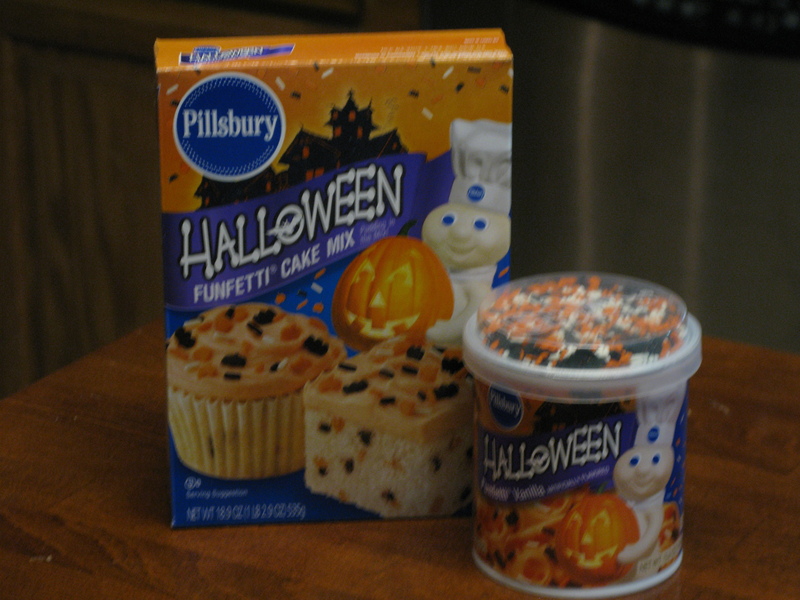 Follow the recipe directions on the box for the cake batter and mix thoroughly before stirring in the funfetti. 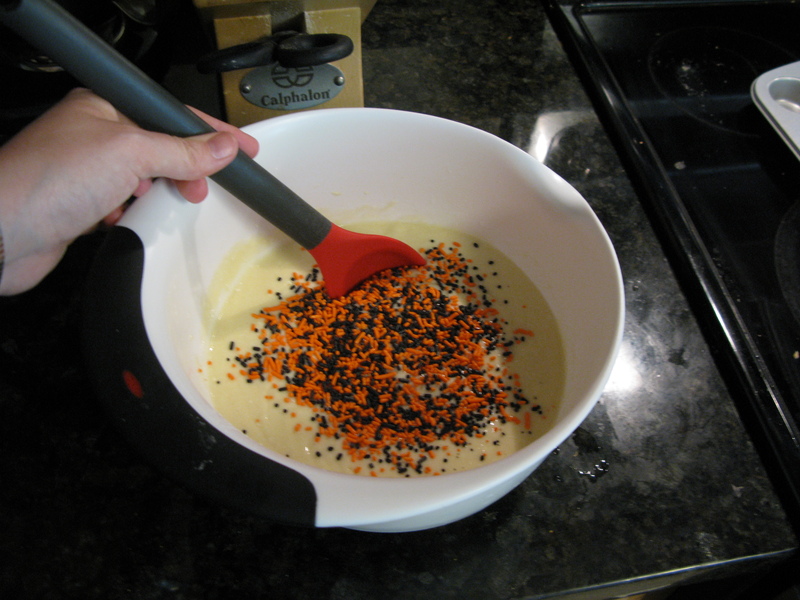 Using my cookie scoop, I filled it about half full and dispensed the batter into the pan with the Halloween cupcake liners, and baked at 350 degrees for about 14 minutes. 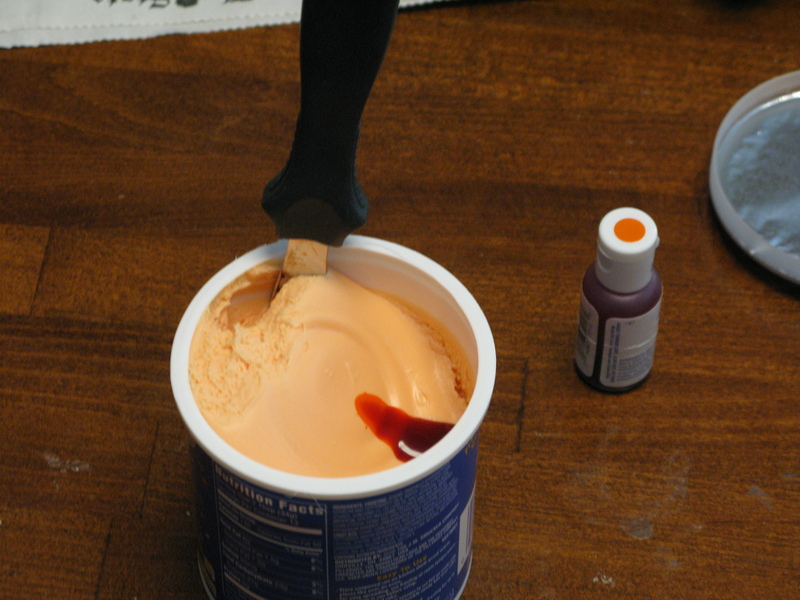 Personally, I wasn’t really impressed with this color orange that the icing came in the container, so I added some more orange food coloring to get a brighter shade that I wanted. The color turned out great! 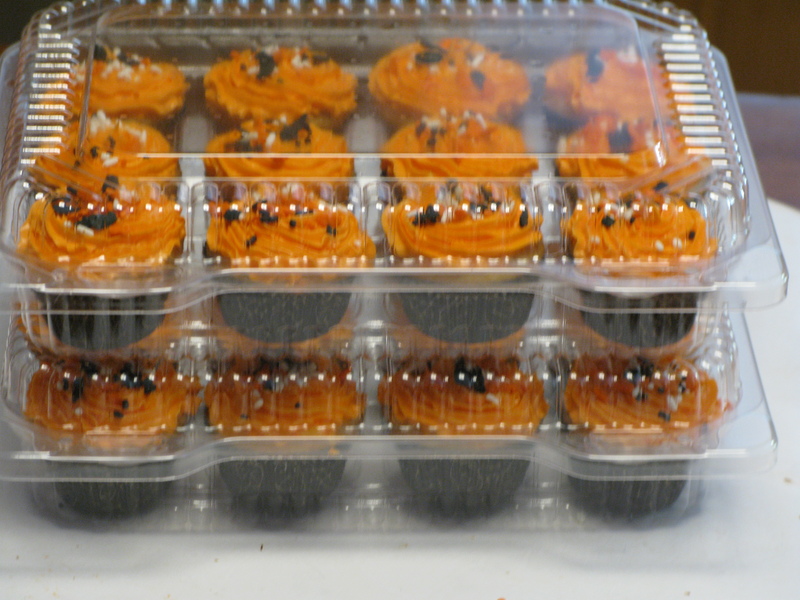 It also goes well with the “Trick or Treat” black cupcake liners that I bought from AC Moore. 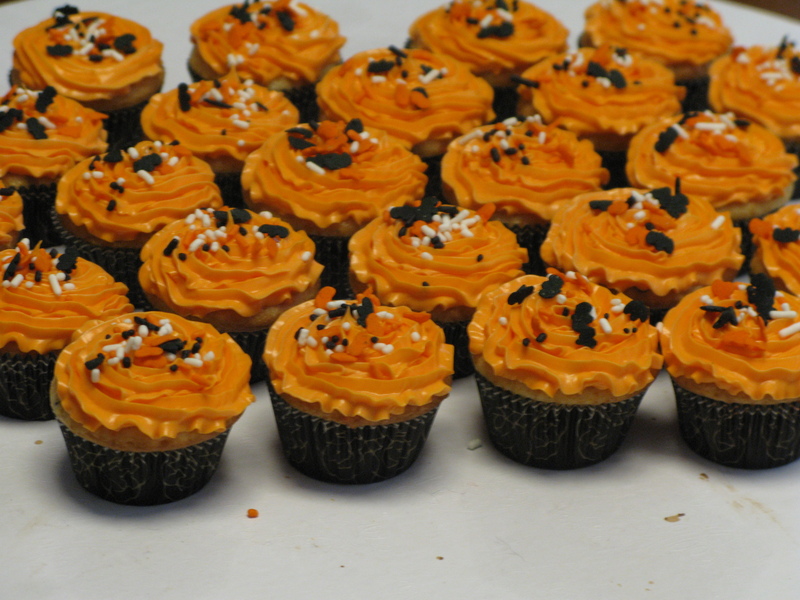 The funfetti just added a little something extra cute to the cupcakes, and the little black ones are shaped like bats. Love it! Here they are, all packed up and ready to go to the Halloween party! This size cupcakes will be great for the little kids. It would’ve been great a few years ago to have known about these plastic containers that you can carry the mini-cupcakes in. Too many times while traveling with these little guys, they toppled over in the car and turned into such a big mess. These containers are perfect! These mini cupcakes are perfect for last minute ideas without having to buy the pre-made cupcakes at the grocery store, and of course are very easy and cute. Did you buy the cupcake holders at A.C. Moore also?